Easingwold had a parish workhouse from at least 1756. It was situated on Uppleby Street and accommodated 30 inmates. Its regime in 1829 was fairly strict, with men, women and children strictly segregated, fires lit only by order of the Vestry, and candles provided only for the sick. Work was performed from 7am (8am in winter) to 6pm with male inmates grinding corn and women doing domestic work. The food, however, was relatively good with four meat dinners a week (Hastings, 1996). North Riding of Yorkshire: Aldwark, Alne, Angram Grange, Brafferton, Brandsby with Stearsby, Carlton Husthwaite, Coxwold, Crayke, Dalby with Skewsby, Easingwold (2), Farlington, Flawith, Huby, Linton-upon-Ouse, Marton with Moxby, Myton-upon-Swale, Newburgh, Newton-upon-Ouse, Oulston, Raskelf, Stillington, Sutton-on-the-Forest, Tholthorp, Thormanby, Thornton with Boxley, Whenby, Wildon Grange, Yearsley. The population falling within the Union at the 1831 census had been 8,010 with parishes ranging in size from Wildon Grange (population 27) to Easingwold itself (1,922). The average annual poor-rate expenditure for the period 1834-36 had been £3,446 or 8s.7d. per head of the population. Easingwold Union workhouse was erected in 1837-8 on Oulston Road. It cost about £2,600 and could accommodate 130 inmates, the first of whom were admitted in October 1838. Women inmates performed domestic work and picked oakum, while men did corn-grinding, stone-breaking and gardening. Boys attended a local parish school, but girls were taught reading, writing and needlework by a pauper inmate. The casual wards lacked toilets and beds with vagrants sleeping on wooden platforms. 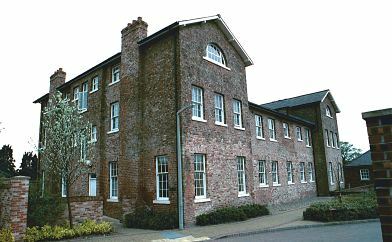 The workhouse building was designed by John and William Atkinson of York who were responsible for a number of other Yorkshire workhouses including Bedale, Beverley, Guisborough, Goole, Howden, Pocklington, Skirlaugh and York. The site location and layout are shown on the OS map of 1910. The main building faced to the south and had a two-storey central block with three-storey wings. Easingwold from the south-east, 2001. Easingwold rear of main block from the north-east, 2001. In 1841-2, Easingwold became involved in a dispute with the Poor Law Commissioners because of its refusal to end the giving of out-relief as required by the 1834 Poor Law Amendment Act. Although, the Guardians eventually conceded, the Board continued to resist the authority of Commissioners in other matters in, for example, ignoring the centrally issued dietary regulations. A 20-bed infirmary was erected to the north of the workhouse in 1869 at a cost of £700. In 1934, the former workhouse was converted to become Claypenny 'Colony' and provided care for up to 200 people with learning disabilities. North Yorkshire County Record Office, Malpas Road, Northallerton DL7 8TB. Holdings include: Guardians' minutes (1837-1934); Admissions and discharges (1882-94, 1900-13, 1922-31); Births (1867-1931); Deaths (1866-1931); Creed registers (1867-1930). Easingwold Workhouse by Dr P Hastings (1996, Ripon Museum Trust leaflet).